In July of 2009, I made a journey from sea to shining sea. I traveled from southeastern Massachusetts to San Juan Island in Washington.My purpose was to visit family and when I set out from Boston, I had no idea what I would find on the opposite coast! Initially, the Pacific Northwest seemed much like New England. Great, green pines along with a giant blue ocean. 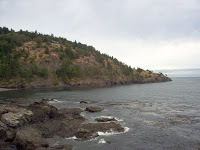 But as I traveled the route between Seattle and the San Juan Islands, the differences became apparent. Mountains! Great, hulking things of all shapes and sizes. The Presidential Range in New Hampshire, what i had known as mountains all my life, seemed like foothills in comparison. Mount Rainer, Mount Baker and the Cascades dwarfed Mt Washington, the largest mountain I had ever seen. 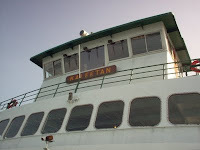 The trip between Seattle and San Juan Island took me through a city, farmland, the Rosario Strait and the San Juan Channel. To get there I took a coach, a van and a ferry.The coach and the van were nice enough, but the trip really started to take shape once I got on the ferry at Anacortes. The ferry landing at Anacortes isn't much to look at, but it had everything I needed when I arrived, the most important thing being a sandwich. Once aboard the ferry, Kaleetan, I chose a seat looking back toward Anacortes and was rewarded with a fine view. Mt Baker rose in pale blue and pink splendor before my eyes! The rest of that ferry trip I spent going from fore to aft ogling everything. I had never seen scenery like it! My arrival in Friday Harbor, San Juan Island coincided nicely with supper-time. I was treated to a fine meal at a local restaurant my family recommended. We sat outside, the weather was beautiful and my meal was perfect. I could not have asked for more! I was treated to a tour of Friday Harbor Laboratories. 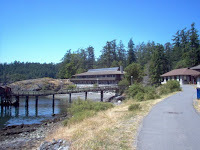 FHL is a marine biology/oceanography research facility of the University of Washington located just outside of town. My brother was there to teach a summer course on seaweed and algae for grad students. It's safe to say it is a very special place. Quiet and serene, I don't think the landscape has changed much in the last 30 or 40 years. Being heavily wooded, the 500 or so acres around the labs are home to lots of wildlife. I saw birds I recognised and some I needed help to identify. Red-tailed hawks hunted the area and deer and their young roamed about. Even though they were shy, they seemed not to fear people. Every person I encountered at FHL was relaxed, friendly and quick to say hello or send a hand up in greeting. Visiting there was the best part of the trip. You're welcome for the deer snapshot and I loved reading this post! I had a blast while you were in Friday Harbor. Now, I want to come visit you and see your little bitty hills! Hi, I'm Quilly's friend. Congratulations on your new blog! I hope you'll find great friendships and enjoy blogging as much as we do. This is a wonderful post. Magnificent scenes! I can imagine that your journey was worth it all the way. Have a great week :). Welcome to the fascinating world of blogging. I am also a friend of quilly's. I grew up protected by the Andes and I need at least a hill to feel comfortable. Your trip sounds fantastic. Looking forward to Part II! Welcome to the wonderful world of blogging. Well, perhaps, not so wonderful but it is what it is. Enjoyed this post and the pictures. It gives me a chance to travel a bit. Another welcome from another friend of Quilly and your brother. I like the photos and appreciate your defining "Talk" in the first post. Hi, I came over from Quilly's blog to say hello! Thank you for sharing your journey with us - the photos are wonderful! Stopping by the way of Quilly, she asked her friends to come by and say hello. Welcome to the world of Blogging, I am sure you will have a ball making your posts.